The Odigitrias Monastery (Μονή Παναγίας Οδηγήτριας στο Σίβα) is one of the most famous monasteries of southern Crete. Unfortunately, in terms of popularity, he is far from other Cretan monasteries so often visited by tourists. 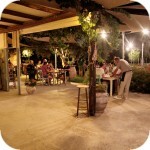 Located a bit away from popular tourist routes, it attracts only those who relax near Matala . Meanwhile, it is worth to look at it because it is one of the most historic and wealthy monasteries of the island. It is a place of great importance and great historical value. The advantages of this place do not end only on these aspects. It is worth visiting this place also because the entire area of ​​the monastery is very picturesque and beautiful. The calm atmosphere that prevails here, makes you feel sorry for leaving the walls of this sacred complex. The Odigitrias Monastery is located less than 14 km from Matala and is located on the border of the Messara plain and the Asterious mountain range. If you would like to get here from Heraklion, you will have to travel about 70 km following the route no. 97 to the south. From this road, take the exit in Mires heading for Sivas, then on Listaros, continue towards Kali Limenes. You will soon reach the monastery, which is located at the entrance to the Agiofarago Park. It is impossible to overlook it because in this place, apart from a large car park, there is nothing else. The location of the monastery near the Asterousia mountains is not accidental. This mountain range was probably the most important cradle of asceticism in Crete. Apparently, it was here in the area of ​​Asterousia that the apostle Paul stayed on his journey to Rome. This fact contributed to the development of such a strong monastic tradition in this place. It also contributed to the fact that the "holy" gorges of Agiofarago and Martsalo, still belonging to this monastery, were inhabited by hermits in the distant past. It was they who in the 14th century decided to build the Odigitrias monastery in the vicinity of these ravines. This area is also today called the "Mount Athos of Crete" which is an obvious reference to the republic of monks on the Athos peninsula in northern Greece. The name of the Odigitrias monastery is most likely a reference to the copy of the icon oδηγήτρια ("pointing the way") from Constantinople, one of the most famous icons of the Byzantine Empire. Confirmation of the existence of the monastery is an official document dated 1393. In the 15th century, the iconostasis was created, from which four icons of the then famous Cretan painter Άγγελος survived to this day. The centrally located church dedicated to the Assumption of the Virgin Mary and the apostles Peter and Paul surround the buildings of the monastery complex. There is a bakery, an olive mill, a wine press, warehouses, a cellar for storing cheese, a small well, abbot and monk's goals, and the graves of the deceased residents of the monastery. Inside the temple there are valuable frescos, icons of famous painters and iconostasis from different periods. On the left side of the entrance gate is the legendary tower Xopateras. Inside the visitors, a small museum was also opened, where you can see the old devices and objects used by monks in everyday life from the 16th century to the present day. The monastery from the outside, like many places of this type in Crete, resembles a solid fortress. The character of the fortifications is emphasized by some of its former walls, which are still visible. The high walls were to protect against attacks by pirates and barbarians of all sorts. Building monasteries in this way was not uncommon in Crete. Thanks to solid walls, the monastery buildings were also used many times during insurgent fights with the occupiers of the island, which were never lacking in Crete. At this point it is worth remembering what role monasteries such as Moni Arkadiou , Moni Preveli and Moni Toplou played during the fights with Turks or Germans. The monks who inhabited them at that time never avoided fighting the invaders and actively supporting the revolutionary activities of the Cretan partisans. Similar events also took place in Odigitrias, which during the many centuries of its existence was also repeatedly destroyed by the current occupants of Crete. This tower was built in 961 by Nikiforos Fokas, so several centuries earlier than the Odigitrias monastery. Her task was to look out for the approaching pirate ships and alert the local population. The further history of this tower is closely related to the figure of Xopateras (Xopapas), who was one of the greatest revolutionary Cretan figures. Young Ioannis Markakis (Ιωάννης Μαρκάκης) came from the poor and neglected village of Manoussanas. He became a monk taking the name Ioasaf, but he did not remain in the spiritual state for a long time. He was an uneasy and energetic figure who could not accept the restrictions imposed on monks, including those regarding the ban on relationships with women. After killing Turk, who offended his family, he was forced by the local bishop to abandon the priesthood. From then on it was called Xopateras or Xopapas, which meant something like "ex-father" or "former priest". After these events, Xopateras became involved in the activities undertaken by the Cretan rebels against the Turkish occupant. The Odigitrias monastery itself became their headquarters at that time. The rebels were hiding in the tower from which they were directing actions against the Ottoman invaders, giving them a decent token. In 1828, the Turks decided to deal with this local resistance movement and sent 3000 soldiers against Xopateras (some sources give the number of 800 Janissaries). When in February 1829 the Turkish army began sieging the tower, Xopateras asked the rebels accompanying him to leave. Only his nephew with one weapon companion, sister, wife and child and five monks from the monastery remained with him. According to historian Kritovoulidis, the fights lasted three days and two nights. On the first day, the Turks attacked the tower again and again, but Xopateras killed everyone without mercy. On the second day they tried to burn the tower, but Xopateras in the attacking army threw 10 beehives with bees that attacked the Turks throughout the day. Thanks to this ingenious defense, the attackers stayed away from the tower for a long time. On the third day, the Turks eventually set the tower on fire. During the fights everyone who stayed at Xopateras was killed. The last one was Xopateras' sister, who suffocated with smoke. He tried to fight the attackers who attacked him, shooting continuously, standing at the entrance to the tower. When the ammunition ran out, he threw the weapon into the fire, grabbed the knife and threw himself with a broken leg on the assailants. The first three, who tried to overpower him, were killed by him. According to some accounts, thirty Turks were killed by Xopateras during the battle, and fifteen were wounded. In the end he was shot and then his head was cut off. To show what fate awaits others who will fight against the Turks, Xopateras' head was nailed to the spear. Then the Turkish soldiers went with her to nearby villages to show how he finished the relentless rebel. To commemorate the heroic struggle of Messara, one of the bravest men, the tower in which he fought was named after Xopateras. Today, every tourist visiting the Odigitrias monastery can visit it. Being here, it is worth going up to the top because from the top of the tower there is a picturesque panorama and you can see the monastic estates from a different perspective. In addition, on the walls of the tower there is also a lot of interesting information about this character. Also during the Second World War, this monastery became a shelter for Greek soldiers and wounded resistance fighters, which was later destroyed by the Germans in retaliation. To avoid destruction and robbery of valuable icons and images, they were moved to the neighboring village of Listaros. In the 70s of the last century, a long period of reconstruction of the monastery was initiated. During this work, electricity and running water were supplied. At the end of the 1980s, forestry services began planting trees near the monastery. To protect the monastic possessions by goats called the plague of Crete, fences were erected. Currently, Odigitrias has a huge estate and extensive lands located in the nearby mountains of Asterousia. In recent years, efforts have been made to renovate buildings within the monastery's borders. Five monks are currently living here, visiting this place you will probably meet one of them. What remains in our memory after visiting the Odigitrias monastery is primarily the atmosphere of total peace. They interrupt him only in a pleasant way, making cicadas noise and the sound of bells hanging on the necks of sheep, which graze in the surrounding hills. In this monastery, almost on the edge of Crete, time slows down and everyday life goes to the background. A nice variety also provides cats, which are plenty here. We do not pay attention to these single wandering under our feet, because there are a lot of cats in Crete and we got used to their presence. However, when the monk carried out a can of food, we saw how many of the herds enjoyed the hospitality of the local monks. All the animals suddenly started running out of their hiding places with loud meowing. We have not seen such a performance during feeding yet. Kittens were eating food with loud purring, munching and other strange sounds. Finally, it is worth mentioning the store that monks run. Its range is rather typical for this type of places, so you will find here both religious and olive oil, herbs and spices obtained from nearby places and other products produced by monks. What drew our special attention to this herb. We have not met such beautifully sorted and carefully arranged laurel leaves. In this approach, you can see both concern for the quality of the product and the satisfaction of the buyer. During the visit in the shop we were also treated to home-made cookies and loukumia made on the spot. I do not think we need to even write how delicious they were. When coming here, it's worth knowing that there is no fee for entry. Although the summer temperatures do not make anyone want to wear more covered clothing, it is worth respecting the monks' request that they do not enter the monastery in too scant and exposed clothing. Redirected from the site - Moni Toplou. Moni Toplou (Μονή Τοπλού) also called as the Monastery of Panagia Akrotiriani, or simply the Great Monastery is one of the most beautiful and important monasteries in Crete. It is located at the foot of the Sidero peninsula and with its 10-meter wall and 33-meter belfry from a distance resembles a fortress. Redirected from the site - Piso Preveli. Currently, the lower monastery is still not open to the public and is not used by the monks. The buildings of the upper monastery have undergone partial renovation and are the main seat of the Preveli monastery. Moni Toplou (Μονή Τοπλού) also called as the Monastery of Panagia Akrotiriani, or simply the Great Monastery is one of the most beautiful and important monasteries in Crete. It is located at the foot of the Sidero peninsula and with its 10-meter wall and 33-meter belfry from a distance resembles a fortress.